What does Oracle cloud mean in terms of licensing? 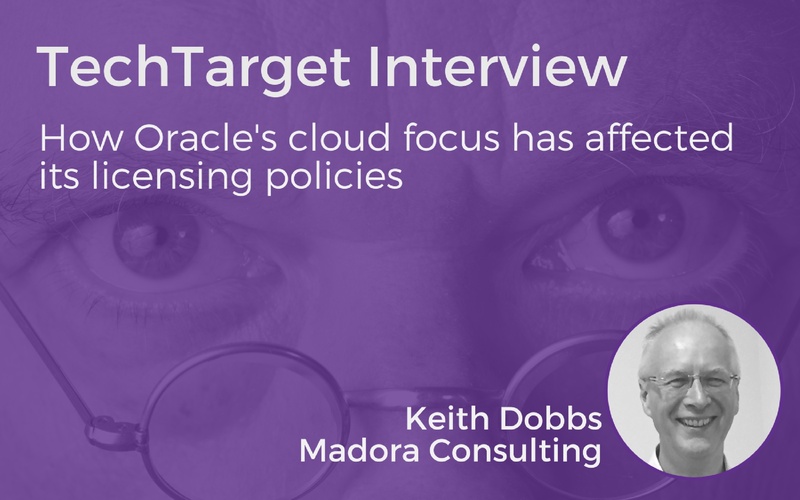 In a recent interview with TechTarget, Madora’s Software licensing expert Keith Dobbs explained how Oracle’s cloud focus has affected its licensing policies and how Oracle Cloud at Customer could change things for on-premises users. How cloud has affected the way Oracle handles software licensing. The basis for cloud licensing. What is covered by the standard oracle cloud licensing terms. Hostings currently allowed under the Oracle licensing rules. Ways Oracle’s trying to tempt people into its cloud. The licensing policy relating to conventional on-premises server environments. The change in process following the launch of the Oracle Cloud at Customer service (announced at CloudWorld in Washington in March 2016). What can we expect next. Please share your experiences below on how have the rules on Oracle licenses in the cloud affected your company. Can you use your Oracle licenses in non-Oracle Cloud platforms?